Welcome to the Hand Sanitizer Store! 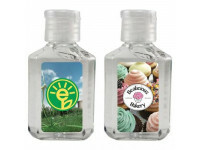 Show customers you care about their well-being, with the gift of personalized hand sanitizer! Starting at only 30¢ per piece, custom hand sanitizer makes a great addition to any marketing campaign, and presents an affordable way to buy in bulk even on a tight budget. 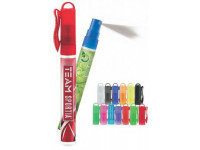 We offer a wonderful selection of custom imprinted hand sanitizer products, ranging from mini-credit card sized sprayers to 16 Oz. bottles that are perfect for any promotion or event. All of our customized hand sanitizers come with a full color label or direct imprint, many of which are under $1 and/or offer 24 hour rush production. Hand sanitizers can be used any time you need to freshen up and there is no access to soap and water, and help prevent infection and the spread of viruses and other diseases. Simply squeeze or spray a small amount into your hand and rub them together front and back. Our large size bottled gels, both with and without a pump, are just what the doctor ordered to prevent the spread of germs and bacteria! Ideal for spas, schools and public restrooms. Doctor offices often keep hand sanitizer pump bottles at their reception desk and in each patient room so doctors can sanitize their hands between patients. 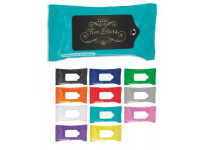 Select a tinted or beaded gel for something a bit more special! Not just for the office, personalized hand sanitizers can be used anywhere. Our hand sanitizer wet wipes, pocket sprays and clip-on gels are ideal for people on the go, and can be easily kept in a pocket or bag for easy accessibility. Perfect for daily use or camping, hiking, biking and other activities where you may have the need to clean hands without facilities nearby. While most of our hand sanitizers contain alcohol to thoroughly kill germs and bacteria, we also offer a selection of alcohol free wipes, bottles and sprays. 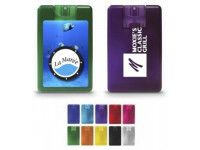 In addition to our great selection of custom hand sanitizer, we also offer a large selection of personalized Hot/Cold Packs in a variety of sizes, shapes colors and styles! Custom hot/cold packs are an excellent way to promote a sports team with your company name and logo to be handed out at sporting events and promotions, and are wonderful for hospitals and doctor offices too. Whatever your need, the Hand Sanitizer Store has you covered. Order online today! We offer a free proof with every order!